Fluid transport and storage systems that operate at high temperatures require specialized temperature maintenance and freeze protection systems. Products such as the Heat Trace Products, LLC. 2300 Series self-regulating heat trace cable are designed to provide high heat output in non-hazardous and hazardous applications. At Heat Trace Products, LLC., we have been designing heat maintenance and freeze protection systems for over 25 years. Our systems are engineered around specific process criteria and operating environments, including the 2300’s self-regulating feature which applies heat only when needed. 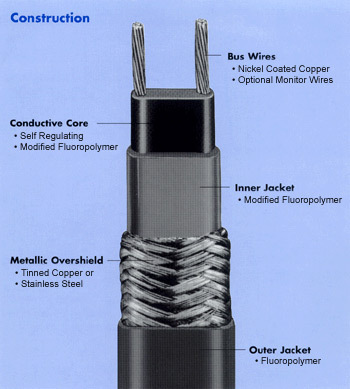 Cable can be cut to length and terminated in the field to help simplify installation. For more on the 2300 Series of self-regulating heating cable, or to learn how we can develop a custom Heat Trace Products, LLC. solution for your application, contact us directly. The industrial grade 2300 cables provide freeze protection and process temperature maintenance for fluid transport and storage systems requiring high levels of heat output or exposure to elevated temperatures. 0.125 /ft *T-Rating per the 1999 NEC, Tables 500-5(d) and verified by FM and CSA.